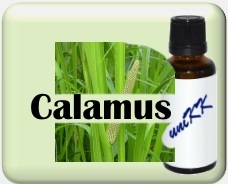 Calamus was even known to ancient Romans and had a significant place in the Indian system of medicines, called Ayurveda. Calamus is a plant that grows best in watery, marshy places. It is native to Europe and Asia. - anti-rheumatic - particularly stimulating for the nerves and blood circulation. - anti-spasmodic - relaxes all sorts of spasms, but is particularly effective on nervous spasms. - circulatory - increases blood circulation and helps nutrients and oxygen reach every corner of the body. This circulation also stimulates the metabolism. - memory boosting - helps to repair certain damages done to the brain tissues and neurons. - nervine - helps maintain the ideal health of the nervous system. - stimulant - particularly stimulating for the nervous system and the brain. - tranquilizing substance - A low dose of this oil can induce sleep and work as a very effective tranquilizer. has a refreshing effect on the brain. Calamus oil should rather be avoided during pregnancy.